Download press release document here. Citizen science key to tracking insect declines in Ireland. With the recent release of a global scientific review confirming that more than 40% of insect species are declining and a third are endangered, many have been asking if this threat of “catastrophic collapse of nature’s ecosystems”, is being detected by citizen scientists in Ireland. Ireland has 11,500 species of insect representing one third of all species found on our landscapes and seascapes. However, to date only 1,051 (9%) have had their conservation status assessed: 26 (2%) species are now regionally extinct, 194 (19%) are in decline of which 130 (13%) are threatened. In addition, until the establishment of the National Biodiversity Data Centre in 2007, Ireland lacked any national systematic insect monitoring schemes and had no way of estimating long-term trends in its insect populations. However, the network of citizen scientists involved in these scheme needs to grow both in size, to successfully detect and monitor rarer species, and in scope so that changes in other key insect groups like predatory beetles and dragonflies can tracked too. “The support we receive from volunteers in these schemes is tremendous, but we have to reciprocate and secure sufficient resources to ensure that the co-ordination, training support, management, analysis and reporting of their data is of international standard”. The Irish Bumblebee Monitoring Scheme was piloted in 2011 and launched in 2012. It is a long-term citizen science project designed to track changes and detect the early warning signs of a general threat to bumblebees and to Irish pollination services. Our citizen scientists record all bumblebees along specific routes over a fixed time and area, walking once a month between March-October (eight counts p.a.). 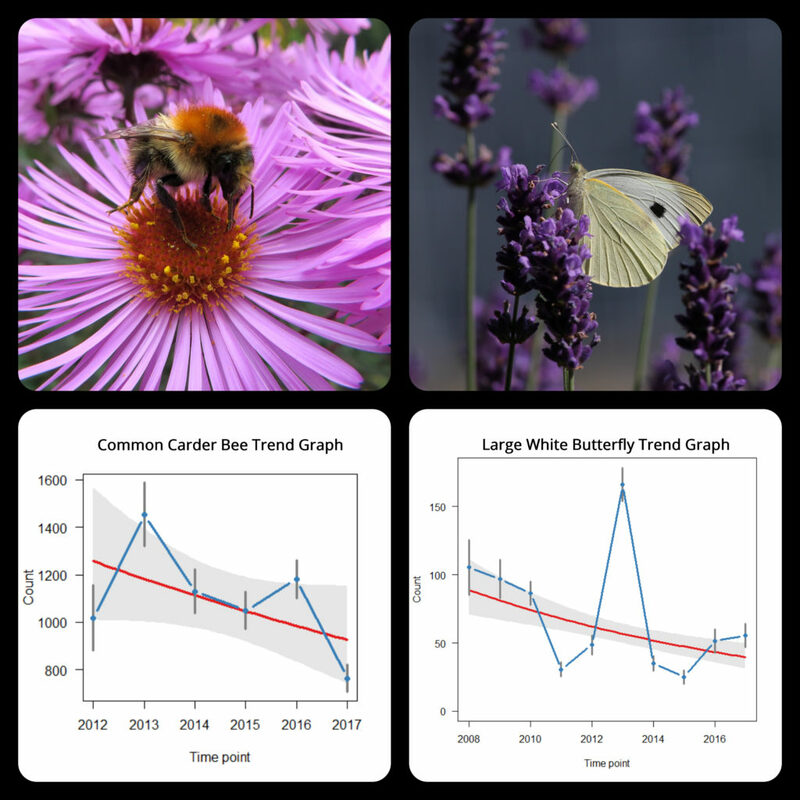 It is one of the first national citizen science schemes in worldwide that tracks changes in wild pollinator populations. Now in its eight field season, the monitoring scheme is now the largest it has ever been, with 74 recorders now monitoring bumblebee populations across 103 sites [map – bumblebee monitoring sites]. It’s humbling to see how much effort everyone is willing to give to support bumblebee monitoring and conservation. In 2017, we collectively walked 883.2 km over 491 hr 19 min and counted 12,969 bumblebees across 14 species. The Irish Butterfly Monitoring Scheme was piloted in 2007 and launched in 2008. It is a long-term citizen science project designed to track changes in Irish butterfly populations, to inform their conservation and as indicators of landscape and climate change. Our citizen scientists record all butterflies along specific routes over a fixed time and area, walking once a week between April-September (max. 26 counts p.a.). Ireland is one of 22 countries across Europe that pool systematic butterfly data together collectively across 4,500 sites each year on behalf of the European Butterfly Monitoring Scheme. These data are then analysed and published as the Pan-European Grassland Butterfly Indicator on behalf of the European Environmental Agency. This indicator shows that since 1990 the abundance of grassland butterflies across Europe has declined by 30%. Now in its 12th field season, the monitoring scheme is supported by 118 recorders monitoring butterfly populations across 123 sites [map – butterfly monitoring sites]. In 2017, we collectively walked 2,858 km over 1,546 hrs and counted 38,186 butterflies across 34 species. The National Biodiversity Data Centre is a national organisation for the collection, collation, management, analysis and dissemination of data on Ireland’s biological diversity. Biodiversity data are a key requirement for understanding our natural surroundings, for tracking change in our environment and for gaining a greater insight on how we benefit from, and impact upon, the ecosystem goods and services provided by biological diversity; a national asset which contributes at least €2.8 billion to the Irish economy each year. The Data Centre was established by the Heritage Council in 2007 and is funded by the Heritage Council and the Department of Culture, Heritage and the Gaeltacht. The Centre is operated under a service level agreement by Compass Informatics Limited, an information and location technologies company focussed on applications in natural resources and planning.